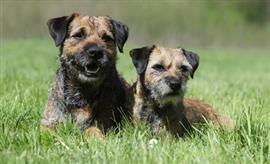 The Border Terrier breed takes its name from its place of origin along the Anglo-Scottish border. Many Border Terrier owners look for names coming from this region. Some of the most common English names are Gabriel, Abigail, and Charles. On the other side of the border, popular Scottish choices include Finley, Ross, and Duncan. Other names like Bell, Graham, and Briar can be taken from historic border clans. One distinct feature of the breed is its head which is often described as otter-shaped. Name ideas borrowed from fictional otters include Marlene (‘Madagascar’), Lottie (‘Return to the Hundred Acre Wood’), and Ed (‘Brandy & Mr Whiskers’). Many other fun choices can come from just about anywhere. A few shoe themed names include Saucony, Nike, Volcom, and Converse. Some of our pages will contain a subcategory. A subcategory is a slightly more specific grouping than the main topic of the page. For a subcategory, we will include a separated table of names and corresponding descriptions. An example of a subcategory of Red Dog Names would be 'Dog Names Inspired by Red Wines'. If you have any subcategory ideas for the Border Terrier Names page, we would love to hear them. Use the form below to submit your ideas.